Believe me, if you see it once, you will keep it in your memory forever. This is one of the most memorable, fascinating, not-of-this-world resembling places on our planet, which looks like some distant star that, unfortunately, is invisible for the human eye. Even scientists, who are quite sceptical to beauty, claim that the area of Dallol volcano looks like a distant Jupiter’s moon, a planet called Io. 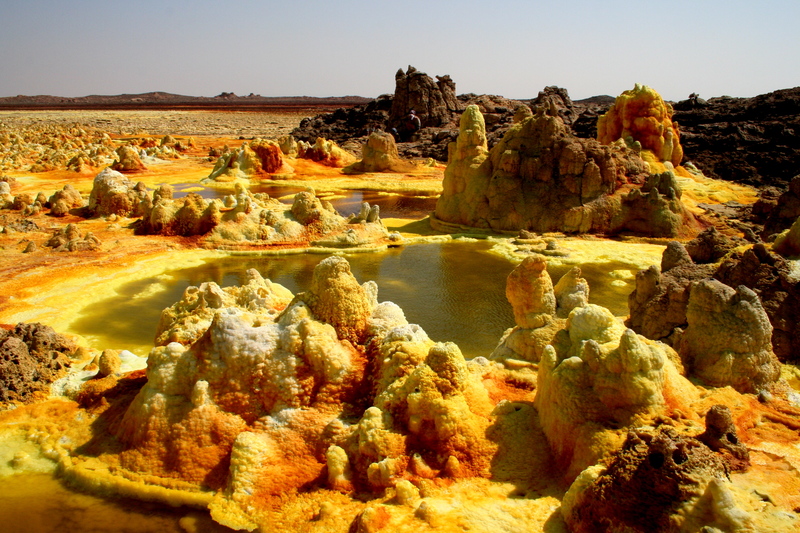 Dallol will enhance your idea of ordinary volcanoes that hide their bodies under water or rise ominously as dark figures, occasionally showing off their smouldering cigarettes and releasing smoke into the air. The basic version of the origin of this volcano, which has a very peculiar shape, is an eruption of volcanic basaltic magma at its very foundation. Wandering in Dallol, you get confused where volcano starts, and where it ends, and even doubt whether it is located here. After the last eruption in the 20's of the past century, a lake appeared inside the crater. 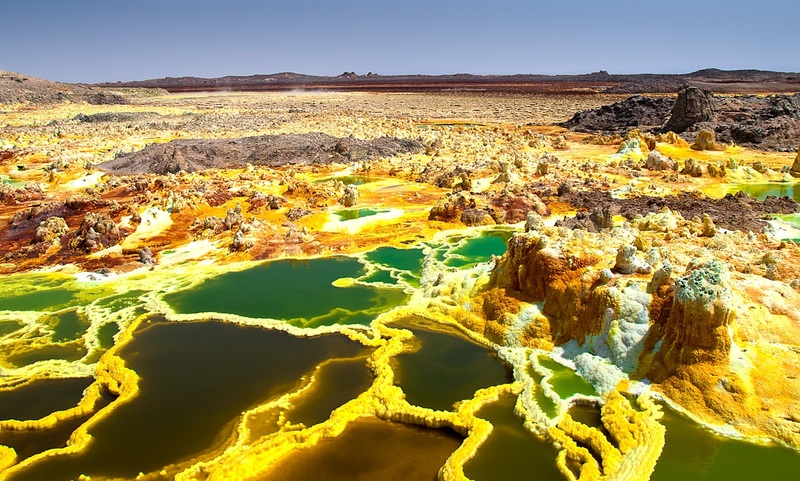 This pond is located at around 48 meters below sea level; therefor Dallol is considered the lowest land volcano in the world. That crater is covered with thick layers of salt. These blankets of mineral make it difficult to release fully volcanic lava to the surface. All amazing scenery, reliefs and landscapes are consequences of activities of restless mountain with crater hidden somewhere deep underground. There is even an impression that Ethiopian kids got colourful paints somewhere, choosing the brightest colours, in their view, sometimes even to the dazzling gaudy colours, mixed all that with water and poured throughout the desert. Green colour derives from the union of ubiquitous sulphur with various other minerals. The colours red clay, ochre and rust colours occur when rainwater falls into gaps, but after some time, being changed little, the hot liquid knocks out to the air from bowels, and minerals precipitate, creating a veritable mineral rainbow. Often poles and small slides grow and freeze at breakthroughs. Yellow colour does not tolerate when someone steps on it, so it can revenge a local pedestrians: they risk to fall and get into a real acid. 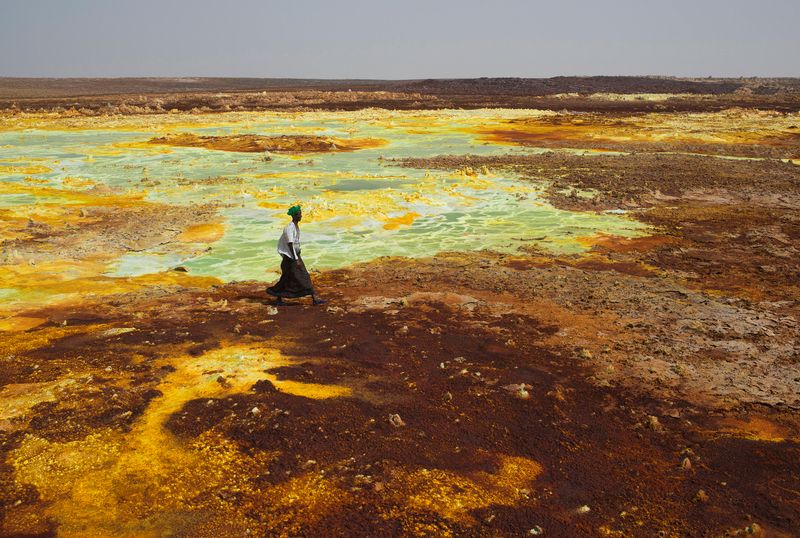 Dallol became a place of death of countless birds and animals. They often succumb to the temptation of transparent water that is actually a boiling saturated solution of magnesium chloride. Such fluids can be heated to about 130 degrees C above zero. Wandering through this otherworldly locality, often on the way you come across thin and light like an eggshell, spheres with holes – they are fumaroles. They arise from the alluvium of small amount of salt. When you stay in the middle of these extra-terrestrial landscapes, where everything evaporates, bubbles at boiling point and hides something hot, it seems that they are not fumaroles, but eggshells, of which just hatched even not dinosaurs, but true dragons. It is not difficult to witness this natural wonder - just book a tour. The only question is whether you will sustain such a journey. This extraordinary site is among the hottest on the globe. In the 60's of last century, the average temperature was +34 degrees C. This indicator supposedly is not very frightening, but the temperature is constantly the same, next to craters fierce hot attacks a visitor on all sides. On top, remember to add permanent toxic fumes of sulphur. 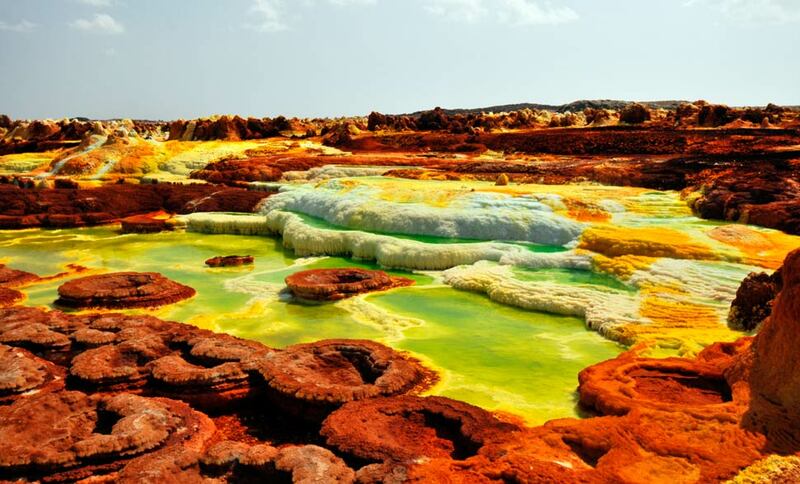 To see Dallol in all its glory, you would better to go there in the rain season, when it rains in Ethiopia and in this desert, because that is when the water pulls out all the riot of colours. Local residents have harmoniously blended into these truly bizarre landscapes. Even invented how to make money on a volcano. Riding a camel, they get Dallol, collect salt crystals in the crater, crush them into slabs and take to the city for sale.